Duncan Jones just posted a tease on his Twitter about his previously revealed comic book movie – and it’s enough of a tease that we’re pretty sure we know what it is. Did you catch it? After zeroing in on a place – Britain – and a specific universe – 2000AD – Jones removes his hat to reveal... a blue mohawk. Look familiar? (No, it’s not Yondu). It’s actually the haircut of a super soldier from Rogue Trooper. 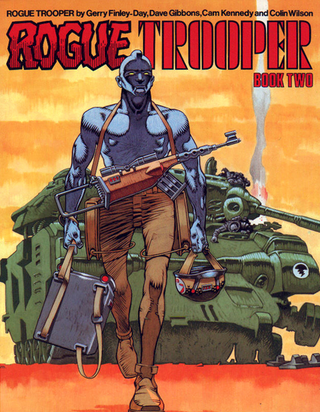 The cover of a Rogue Trooper collection. Rogue Trooper, from the same publisher as Judge Dredd, is the story of Rogue, a blue-skinned supersoldier during a war on Nu-Earth between the Norts and Southers, a horrible scifi conflict that’s a nasty blend of the World Wars and the American Civil War. In the origins of the comic, Rogue and his allies are hunting the Traitor General, a dangerous Souther who massacred his entire regiment of supersoldiers. It’s nasty, exciting stuff.